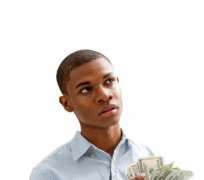 The average Nigerian dude (not necessarily the f*ckboy) wants to ball. You can’t really judge them either, because…you only live once. YOLO! Sundays: big boy brunch at Oriental and football time at the bar later in the day. As a dude, you have a number of hobbies and activities you engage in, to keep life eventful and interesting. It could be fitness, or just games for leisure. The thing is, a number of these hobbies require ongoing upkeep costs; from club membership dues, to cost of supplies, uniforms, and even trips/get-togethers. Yes, you want to join in on the Sunday brunches with colleagues; you want to prove to your girlfriend, who loves fancy food, that you are enough for her; you also want to order from ‘The Place’ like your colleagues, instead of brining something homemade or buying from the lady across the road and being the “stingy” or “low-class” one. But if you are concerned with upgrading your financial status, you will have to skip these splurges. They seem small, but actually, they accumulate and take a toll on your finances. You will be surprised to find out that sometimes, the cost of the daily take-out is what, over time, separates the rich dude from everyone another dude the wrong side of the thin money line.